Now you must be thinking why on earth am I going to write about a set of chained restaurants, trust me peeps this is worthy of the write up. In my eyes, this is one of the awesome chained restaurants we have in London! For those who not in the know “Côte is inspired by the brasseries of Paris serving authentic French classics made from great quality, fresh ingredients.” We have eaten here at least 10 times in the last 12 months and there are reasons why , so here are our 5 reasons why you should dine at Côte Brasserie. Côte Brasserie has a dish for everyone, the fish lover, the veggie and the meat lover. French cuisine is renown for its’ clean flavours and well use of seasoning, and this is where Côte nails it as their dishes have rich and clean flavours. #2 Set Menu starting from £10.95! Now set menus are normally super limited, but Côte’s set menu has fish (I have had Salmon, Hake and Sea bass previously from their set menu – delicious! ), vegetarian and meat options (including steak) available on their set menu, with decent portions sizes depending on what you order. They normally have a 6 starter, 6 main and 6 desserts on their set menu to select from. 2 courses will cost £10.95 and 3 courses is £12.95 (this can vary); absolutely great value for money! You just have to bear in mind this deal is available only Monday – Friday between 12-7pm, so perfect for an after work dinner. Their service has never failed on us before, only recently the Tower Hill branch we went to was almost a full house and extremely busy, so our starters took about 30 minutes or so to come out, however rather than us querying with the staff about the whereabouts of our starters, they had come over to us to apologise for the wait. I think this is one of the rare times a waiter has been proactive to tell us what was going and causing the delay. But despite this incident, we have always been extremely pleased with their level of professional and prompt service. 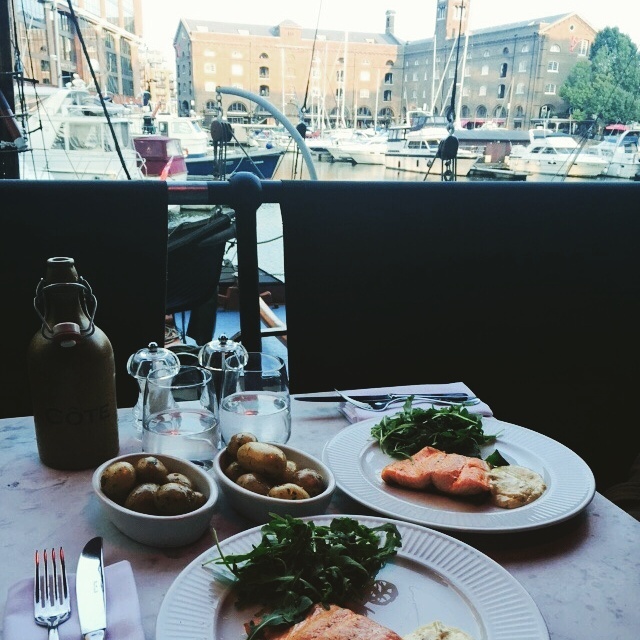 The video above says it all, this is our favourite Côte branch in Tower Hill, London (St. Katherine’s Dock). They have branches across the UK, so there should be a branch near you! To find your nearest restaurant location, just click here. Their restaurant has a sophisticated French style cafe-interior, with a great atmosphere. It can a bit mundane when a restaurant does not change up their menu or not add any new dishes, especially when you visit them repeatedly. Côte change their menu regularly, their set menu change every month, so your bound to try something different each time! Overall Côte is super value for money for food that will leave you satisfied and with no quibbles. A perfect restaurant for a quick catch up with friends over a dinner, as the atmosphere and ambience is perfect for it. If you have already been to Côte, let us know know your thoughts on Twitter @LondonKiLadki. I love Côte Brasserie. The one in Camden town was where we were always meeting with my French colleagues: great food and it’s affordable: what’s not to love?